Ideal for miniature work with plastic, thin metal and balsa wood, this set includes a 6” aluminum mitre box and a 5” fine-tooth razor saw blade and handle. 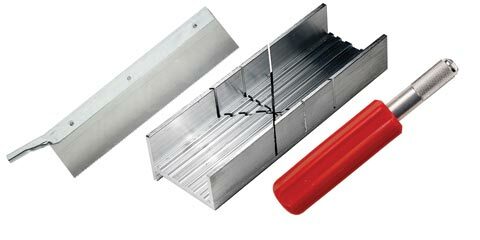 Each unit of the mitre box has two 45° and one 90° angle cutting slots. The saw blade has 54 teeth per inch and a cut depth of 1.25".